It’s almost Thanksgiving, a holiday that once celebrated the harvest season. Although many of us today may not be directly connected to agriculture, we still gather on Thanksgiving with our loved ones to share whatever “bounty” we may have. But this practice doesn’t have to begin and end with food. Why not incorporate the spirit of sharing into your overall financial strategy? Make financial gifts. You could give shares of stock to your loved ones, or perhaps give them money to help fund their IRAs. (They must have earned income, however, to be eligible to contribute to an IRA.) You can give up to $14,000 per year, per recipient. If you are married, you and your spouse can each give up to the $14,000 yearly limit. Invest in your children’s future. To help your children meet the high costs of higher education, you might want to invest in a college savings vehicle. One option to consider is a 529 plan. When you contribute to a 529 plan, your earnings are subject to tax-free growth potential and distributions are free of federal taxes, provided they are used for qualified higher education expenses. (Keep in mind, though, that Section 529 plan distributions not used for these qualified expenses may be subject to income tax and a 10 percent penalty.) Furthermore, if you invest in your home state’s 529 plan, you may receive state tax incentives. Tax issues for 529 plans can be complex, though, so you’ll need to consult with your tax advisor about your situation. Another benefit of 529 plans: You control the assets right up to the point at which they are actually used. So, if you have been putting away money for a particular child (or grandchild) and he or she decides against college, you can easily switch to another beneficiary. Review your insurance policies. If something were to happen to you, is your life insurance sufficient to take care of your family? In other words, would there be enough money available to pay off your mortgage, send your children to college and help your surviving spouse meet at least some of his or her retirement expenses? A financial professional can help you determine if your life insurance is sufficient for your needs. Consider involving your family with your estate plans. To help ensure your wishes get carried out the way you intended, consider keeping family members informed of your estate strategy, which could involve your will, living trust, power of attorney and other legal documents. And don’t forget to keep your beneficiary designations up to date on your retirement accounts and your life insurance policy. So if you’ve gone through changes in your family situation, such as a divorce or remarriage, work with your professional team, including your financial advisor and your tax and legal advisors, to make ensure your investment strategy aligns with your estate goals. Once the turkey is eaten and the football games have ended, Thanksgiving will draw to a close. But consider these strategies sharing your “bounty” with your loved ones all year long — and throughout your lifetime. I know Christmas is right around the corner when Irene Morris, a long time Raymond resident and an avid supporter of the library comes in to tell me that she will be delivering a Christmas Wreath to adorn the front door of the library, very soon. Children are beginning to check out Christmas books, adults are interested in cookbooks and craft books and audiobooks to listen to as they travel to a loved one’s homes in another state or they may simply looking for a good book to read on a snowy winters eve. And everyone wants to know what everyone else is doing for the holidays even if they have never met before. Public libraries are community gathering places and libraries are safe places of refuge where everyone knows they will be treated with welcoming good cheer not only during the holidays but all year round. There is nothing more special than a town that has a public library! Here is what is happening at Raymond Village Library during this holiday season. Each year the Raymond Village Library, in conjunction with the Raymond Lions Club sponsors the tree lighting on the library lawn. Everyone is invited, bring friends and relatives, join in the carol singing, enjoy the refreshments and the youngsters are invited to a special story time at 4:30 p.m. at the library. There will also be a surprise guest for the little ones. All this on Sunday, November 30 at 5 p.m.
All types and sizes of decorated baskets with fun, interesting and unusual gifts inside are on sale now through the holidays at the Raymond Village Library. Be sure to check them out when you come into the library, you can’t miss them. They can be that perfect present for teachers, hostesses or a special friend. On Sunday, December 14 from 10 a.m. to 4 p.m. the library will have tables filled with decorative cookies, delicious pastries, yummy pies, breads, candies and all kinds of scrumptious sweets presented in festive wrappings. These goodies will help cut down on your holiday baking and make thoughtful gifts. The Polar Express™ returns to the Maine Narrow Gauge Railroad Company and Museum for another season of magic! The first train to the North Pole departs from Portland the day after Thanksgiving. Guests on board meet the Conductor, enjoy hot chocolate and cookies, listen to the reading of the story and sing along with carols as they journey to the North Pole. Santa greets passengers aboard the train and every child receives a special bell as a souvenir of the event. Tickets often sell out, so advanced and early reservations are recommended. 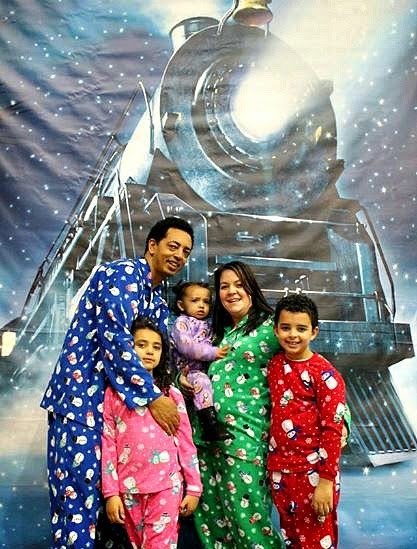 The Polar Express™ runs from Thanksgiving to Christmas, with tickets ranging in price from $25 to $40 per person. Both coach and first class seating options are available. For more information, or to reserve tickets, contact Porttix at www.porttix.com or 207-842-0800. The Polar Express™ is the largest annual fundraiser for the museum. Nearly 12,000 passengers ride to the North Pole aboard the museum’s historic steam powered train each holiday season. The Maine Narrow Gauge Railroad is pleased to partner with Rail Events, Inc. through Warner Brothers Consumer Products, to bring the officially licensed Polar Express™ event to Portland. The holiday film the Polar Express™, originally released in 2004 by Warner Bros. Pictures, is an inspiring adventure based on the beloved 1985 children’s book by Chris Van Allsburg. The Maine Narrow Gauge is the only officially licensed Polar Express™ event in the State of Maine. Founded in 1992, the Maine Narrow Gauge Railroad Company & Museum is a non-profit museum with a mission to educate the public and preserve historic equipment related to Maine’s two-foot gauge railways. Five two-foot gauge railroads operated in the state from the 1870s through the 1940s, serving as an important part of the economic development of the interior of Maine. The museum has become an important visitor attraction for the greater Portland area drawing over 32,500 visitors annually, including tourists and area residents, to experience this remarkable piece of history unique to the state of Maine. The museum is open from May 10th through October 19th (Saturdays to Thursdays) from 10 a.m. to 4 p.m. and seasonally for events. The museum is closed to the public on Fridays. The railroad is located at 58 Fore Street in Portland, on the waterfront, just a short walk from the Old Port. Directions and more information about the museum can be found at www.mainenarrowgauge.org or by calling 207-828-0814. So I was talking to my 15 ½-year-old lab Daisy the other day (I’d talk to her sister Rosie too, but she’s pretty deaf), and I asked her if she was looking forward to the holidays. Of course, Daisy didn’t answer me (I’m odd, but not that odd), but it got me thinking about the holidays from my pet’s perspective. The holidays are my favorite time of year, but if you are a dog or cat they can be a little hazardous. 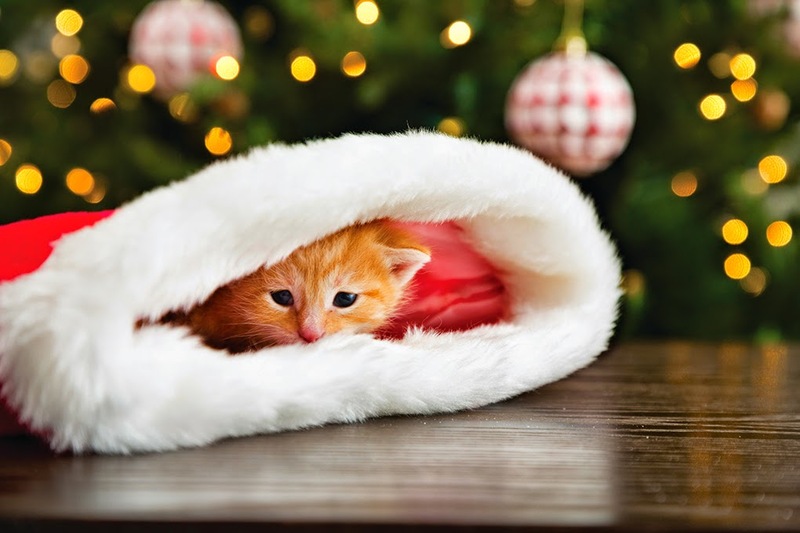 Every year at this time I see a number of pets that get sick or hurt in holiday-related ways, most of which can be prevented with a little planning. Take Christmas plants and decorations: Sure, they’re beautiful, but for an inquisitive cat or a hungry dog, they can be pretty risky. Chewing on the Christmas tree or drinking the water from it will give them an upset stomach, but if you add a fertilizer or preservative to the water, they can really get sick. Poinsettia, holly, and mistletoe leaves will mainly cause vomiting if eaten, but the berries of holly and mistletoe are toxic. The really dangerous holiday flowers are lilies. Many varieties can cause kidney failure in cats that eat just a small amount, so do your cat a favor and keep lilies out of the house. Even the present wrapping can be dangerous: Many cats love chewing on ribbons, and I spent my first Christmas Eve as a veterinarian surgically removing three feet of green curling ribbon from the stomach and intestines of a big gray cat named Mr. Belvedere before it could kill him. Tinsel can have the same effect, so it has been banned from my tree ever since I became a vet. All of the other things that pets seem to like to get their mouths on this time of year can cause problems too: Chocolate (particularly baker’s and dark chocolate), potpourri, Christmas lights, electrical cords and batteries. Even the leftovers from the table can make them quite sick. Finally, remember that just like us, some pets get very stressed this time of year. Not all of them enjoy the noise and crowds of parties, so make sure to give the shy ones a safe, quiet place to hide from all of the festivities. Oh, and Daisy says to have a wonderful, safe holiday. Fifth grader Reegan Burke is The Windham Eagle student of the week. Reegan attends Manchester School and is in Andrea Lavigne’s class. She lives with her mom Beth, dad Jason and a brother Jacob. She also has a cat named Charlie and five fish. “Reegan is the sweetest most thoughtful fifth grade student! She always thinks of her peers and never forgets to include someone. She has worked extremely hard this year on her multiplication skills! She has also blossomed into an excellent fifth grade reader! Reegan, your hard work has paid off! Miss Lavigne and Manchester School is proud of you!” said Miss Lavigne.